Having a payment gateway that processes local payment methods, including local credit cards, is needed for success trading on the internet. All countries have rules and regulations on which payment method can be used and when. To that end, China has its rules and regulations and will not allow a Chinese business to operate payment processes on none Chinese approved systems. This applies to all internet transactions processed on server / cloud / data centres located in China. all payment made in China must be to a Chinese bank account. An overseas business needs to have access to some parts of these payment gateways if you want to trade widely and successfully with Chinese people and businesses. “If you cannot take a payment you cannot process an order”. China have their own very successful payment processing systems and gateway for day to day trading. Historically China has used cash and bank money transfer. The transfer for monies between account and bank has always been fast. A few minutes between accounts and only a few hours between banks. Today, like in the rest of eastern Asia, touch payment system from your mobile is replacing cash. In China we are seeing increasing number of stores on longer taking cash. Historical Chinese citizens the business credit card processing system is Union Pay. Today, some Chinese credit cards will support Visa and MasterCard processing. Union Pay is still the majority supplier for credit card processing in China. We recommend that you speak with your business credit card processing company to ensure you can take a payment from a Union Pay credit card. When processing a Chinese credit card, the monies are taken from the Chinese bank account in your local currency. The purchaser has already exchanged the monies into your local currencies at the Chinese bank. When using a Chinese credit card overseas it operates like a Debit Card as the funds are taken from the Chinese account to successful complete the credit card processing transaction. Normally within a few seconds confirm on their Chinese mobile. Please note: currently most Chinese cards will need “swiping” as the “chip and pin” / “contactless” processing is not compatible between countries. The roll out of payment system in China is happing very fast and many people and business prefer these systems as no cash is required. A local charge card is where you have put small amounts money into on to the card at the outset. Then stores, etc. take touch card payment. There are different operators in different cities / areas in China. Often you will find these systems used in food halls where you purchase a prepay card before you purchase and pay for the food with your card. This allows the food halls to process many orders very quickly and unclean money is not handled by the staff serving food. These systems have been used widely in China for the last 10 years as they remove the need to carry cash, visited banks, etc. Today these cards have been replaced with APPs on smart telephones. The processing is the same as with the Change Cards. Just the need for the card has been removed. These are the main on-line line payment processing gateways used on the internet in China. Alipay, owned by Alibaba, was the first of the major on-line payment processing systems. WePay, owned by Tencent, is a new system and with its full integration with WeChat is becoming very popular in China. Both gateways system supports on-line payments, touch payment APPs (therefore replacing local Charge cards) and increasingly bank services. These systems are cheap are to used, 50% to 75% cheaper payment system we use in Europe. You can open Alipay and WePay as an overseas citizen or business. 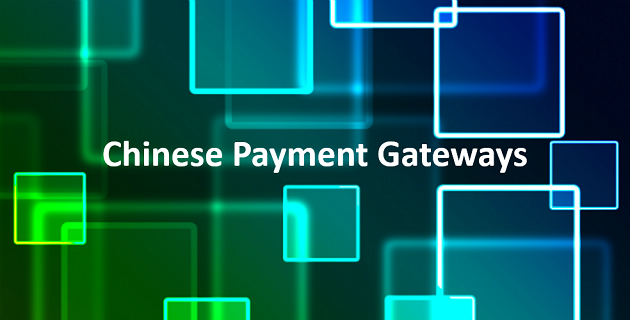 The trading rights you have with these payment gateways within China is changing monthly. We recommend that you contact the payment gateways directly and find out their terms and conditions. Will your payment gateway allow a Chinese citizen or business to make a payment in my on-line store in local Chinese RMB currency and have the monies available to an overseas bank account? If your internet presence is being processed in mainland China, regardless of what the payment gateways say, you must have a Chinese bank account and business. The work-around is to have your Chinese on-line store operate outside China. Have a local marketing presence in China point at the overseas Chinese store. Tmall Global operate this way for overseas businesses (based in Hong Kong). Many Chinese citizen often have an overseas bank accounts, which is legal, so they have access to overseas payment gateways and credit cards. Therefore, your existing payment system will support some Chinese business in your local market. Make sure you credit card processing payment system can process Union Pay. Monitor the international progress of Alipay and WePay. Once they can process Chinese citizens paying in Chinese RMB directly into your bank account outside China then it would be a good time to install them as a payment option for the Chinese market.